Peeve: "Look, I'm not trying to judge (but I'm going to anyway)..."
Why not be honest and say what you have to say? Is "No offense, but..." also your peeve? I love "No offense, but..." It is a classic passive aggressive technique guaranteed to annoy whoever you are secretly trying to offend. An old journalism school maxim: " 'But' erases everything before it." Most of my wife's conversations with me begin "I love you, but..."
The trick is to get her to reverse the clauses. ..
You mean people stand outside Walmart playing rap music? No music was involved. Though there was some cheering on of a person currently running for president. I was going to put "Guess who it was?" but I figured I'd make you work for it--no easy prompts! pet peeve: granted, I am a guest in my sister'site house, but the toys on the stairs to the basement. She has three kids: my beautiful 3 year old Lexi, sweet one year old Maya, and newborn Stockton. So you know how it is with kids. But I hate the toys on the steps. She has rules like: Lexi likes to put this bucket on her head and run around (seriously, and it is so adorable), but she can't do it near the stairs. I just cringe a toys on the stairs. It is a tripping hazard. I have a mild phobia of stairwells--the kind in houses, not big buildings or porches. Pet peeve: clearing hazards in other people's homes. I don't like doing it, but I'm not visiting to give first aid. You are now accused, henceforth and forevermore, unto ages of ages, world without end, so mote it be. I agree. Small things can be taken care of. No one wants to trip down the stairs and break a neck. You should hang around clergy meetings when we discuss "Most Dangerous House Blessings." I bet hoarder homes are fun! No. Mostly smelly, and very sad. Only had one case. There was a ray of hope: one of the kids had a room that would have made the cover of 'Better Homes and Gardens.' She did it all on her own. The real danger are territorial pets confronting bearded men in black outfits. Though, at the last house, the rescue dogs the owner swore would remain cowering under the table came out and stuck to my legs like they had static cling. A friend of mine lived with a hoarder mom and his room was also a model of cleanliness and order. Once he went to college though the jungle consumed it. .....Or first responders. I think there may be about 2 or three failed attempts at using a real sentence if that happens (AND if we are competing with a flipping dog we didnt know about, or multiple cats, or both, or an ill tempered sea bass in a dilapidated house / apartment it becomes many times more obnoxious ); followed by incomprehensible foaming at the mouth,possessed like muttering, and strings of expletives. If you have the right magic mix on a call, I can probably ramble, foam, cuss and yell like for a good hour all without ever really saying anything and only taking three breaths of air. Also, what's with Americans and animals? They aren't spoiled three year old mamma boys, theyr're animals. It's good and right to love and respect the domesticated ones, but still it's like a crazy fetish with Americans. I don't get it. -Touching me to get my attention. That sets off a flight or fight response sometimes, and I do sometimes unconsciously swing at a person when they do that...but I don't blame myself for doing that. You really shouldn't do that. -Being the guy who can never accept information or facts in a mundane conversation, and is always trying to debate, clarify, qualify, quantify, "one up", or add some irrelevant information I don't care about. Nobody cares how smart you are, how many women love you, how much you can bench, the depths of your soul, the triumphs or tragedies of your life, how fast your car can go, how good your art is, or whatever.....just be quiet and show when it is appropriate, I dont need to hear these things. Keep to the conversation at hand and keep some basic common decency, common honesty, common sense, and self respect. I guess bartender, bouncers, and healthcare workers have a million and one pet peeves. We could probably ramble on and on about such things. If I were to write everything down, it would probably look like some deranged manifesto. -Being the guy who can never accept information or facts in a mundane conversation, and is always trying to debate, clarify, qualify, quantify, "one up", or add some irrelevant information I don't care about. Nobody cares how smart you are, how many women love you, how much you can bench, the depths of your soul, the triumphs or tragedies of your life, how fast your car can go, how good your art is, or whatever.....just shut up and show it when it is appropriate and keep to the conversation at hand and keep some basic common decency and self respect. This should be reported to police. I don't like the "seen" feature on Facebook Messenger. It's annoying when you message someone several days ago, they read it, and then don't respond. I'd yell at you, but my mind wouldve gone there too. The inner 12 year old boy never leaves. My friend and I once had the idea to write a totally awesome script as a 12 year old boy hopped up on pixie stix and gogurt would. It turns out it was just rewriting the movie Van Helsing. .... "And then there was Dracula! And WOE!!! A totally sweet werewolf comes up holding a totally awesome gun....AND HE'S FIGHTING FRANKENSTEIN and Van Helsing who has the most awesome and deadly Vampire Crossbow!!!!! WOE!!!!!" ....I guess you can add 12 year old boys hopped up on gogurt and pixie stix to my list of pet peeves. When I go to take the trash out before work and one of my roommates says they'll get it and then it's still there when I get home. So now I have to take it out at midnight instead of the afternoon. When people pay with cash when I'm about to close. Besides, I have a mild form of bathmophibia. Fear of going up and down stairs. Seriously. And slopes I believe. You can Wiki for the specifics if you are curious. I would just post the link, but am on a phone. I do fear baths, but that is not bathmophobia. Well, I like baths, but because of seizures I am uneasy about them, which is prudent to a degree. The psychologist asked me about irrational fears, but said things like that are prudent, not a sign of illness. And in any case mild phobias, like arachnophobia are far from a sign you are crazy. But if you turn into Monk, there is a problem! Mild phobias are very normal. I would say over half the human population fears spiders. I do. So irrational! These little things, often smaller than a quarter, and rarely deadly, we have a fear of. If there were giants, would they fear us? I am sad that you never got the chance to be a 12 year old boy hopped up on gogurt [I didn't have Gogurt at 12, but sugary yogurt is sugary yogurt] and pixie stix. I guess bartender, bouncers, and healthcare workers have a million and one pet peeves. We could probably ramble on and on about such things. Haven't done the bouncer thing, but I agree. My name is Van Helsing. I was raised on giant pixie stix. Dracula killed my family when I was an 11 year old boy. At the age of 12 I became a man who surfed totally awesome waves with a totally awesome crossbow slaying the undead while searching for Dracula. That's why I think it would be totally radical to write a story about my life. If you have any information on The Count, please PM me, I have a date with hiim.... a stake dinner. I didn't have the luxury to be eating gogurt at 12. If you have any information on The Count, please PM me, I have a date with hiim.... a stake dinner. You can PM Dracula if you'd like. He's on post moderation right now. A dirty counter or table. I hate it. Jurisdiction: Diocese of the Southern U.S.
Peeves: (chemically justified) people who douse themselves with perfume or after shave 3x or more per day because they have b.o., or are hopelessly looking for a mate of some sort. The same, above, done by Latin american men or African American men, wh repeatedly try to say"hi" to me at work or on the bus. This, above, done by the same individuals who stop saying anything and go around with a desperate stare on their face all the time when they realize it will be a cold day in hades before they ever attract a mate. Mega- beards, earlobe plugs, tattoosgladiator haircut and and Poindexter eyeglasses all on the same guy or girl. OCD: not being able to leave home without backpack, umbrella, wallet, keys, prayer book and komvoskini - even if I've been invited to a 5 star restaurant for dinner. Baggy polo shirt things. The shirt should fit well to the body. The baggy ones are vulgar and tasteless. Loose shirts in general. Often checking my wallet and VNS magnet is on me. Making sure the latter is in the back as far as possible, so that it does not screw up my computer again. Making sure the table is set properly. Something I would do in college for fun. It irks people the right way. Of course, if done well, it can look good. I am going to mock your outfit as a fashion expert! Pet peeve there. The fashion police who, when a big star dresses badly, write snide little mocking comments like: it looks like she just put some mesh around her. They can be mean. There is this one actress I had looked up. So my phone was saying I have shown an interest in her. Two or three times she wore something "ugly". They got snide in a little article on it. One was really mean. The patronized her by telling her she was beautiful but, mocking her, said she was too short for the runway. And not skinny enough. The girl is not fat. All these comments must have hurt her. One model I am fond of was, and this is common in the industry, told she needed to watch her weight for gaining two or three pounds. She said the whole industry made her so depressed. Now she is acting, and has joyfully left the industry. I just can't stand these poor girls being hurt by a bunch of...the rules prevent me from saying the word. People say they are spoiled and rich, so to heck with their feelings. But they are human, and delicate. It's just plain mean. 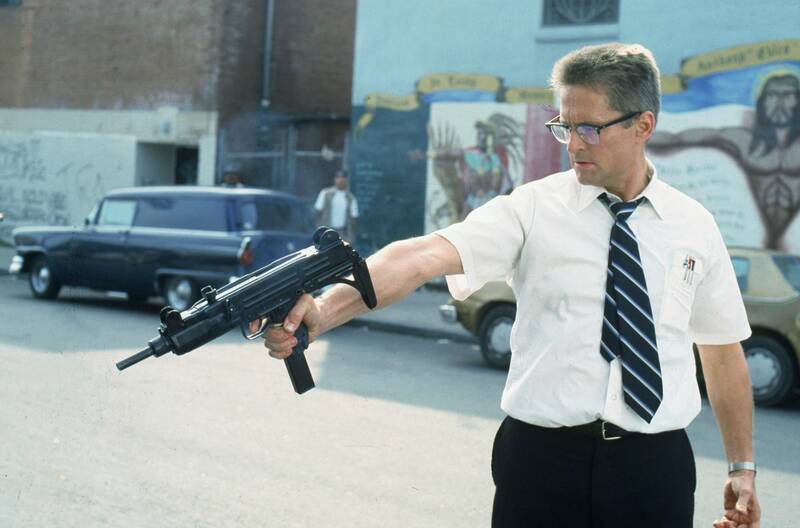 Edited to adjust size of photo in order to allow everyone to behold, as much as their eyes can bear it, the glory that is Michael Douglas in Falling Down. Pet peeve #220: The lies we tell ourselves and our children, along the lines of: 'You can be anything you want to be,' 'You can accomplish anything you set your mind to,' 'no one ever got ahead by taking shortcuts,' 'cheaters never win and winners never cheat,' 'if you're not cheatin, you're not trying,' etc.